Jennifer Bacon grew up in Miami a member of a tight-knit family. Her father worked in economic development and eventually became a minister and her mother worked in banking. The family spent every break from school on the Southside of Chicago or in Mississippi. They learned about civil rights first-hand, because the family had lived it. After graduating from Tulane University, Jennifer began her career as an elementary school teacher at McDonogh 42 in New Orleans. Just two days into the school year in 2005, Hurricane Katrina hit the city, devastating Jennifer’s school and displacing her back to Miami. After witnessing the destruction set upon her neighbors – both natural and man-made – Jennifer decided to attend law school at College of William & Mary in Virginia so she could advocate for those who need protection. She has now been a teacher, school administrator and a lawyer defending the civil rights of the elderly and students with special needs. As a teacher, school administrator, lawyer and community organizer, why is education such an important issue? From a young age, my parents taught me that education was freedom. With a good education, you could take advantage of life’s opportunities. Generations of my family sacrificed and advocated so I could get that good education. My parents pushed to get me into an IB program, where I was one of the few African-American students. Most of my other black friends, who had just as much potential as me, didn’t get those same opportunities and many of us ended up on vastly different life tracks. As teachers, we work tremendously hard and pour our hearts into our students. And still, we see kids slip through the cracks. Finding ways to support teachers and schools so all kids get those great opportunities is now my passion. As an educator, school administrator, lawyer, and community organizer, I’ve committed my life to advancing opportunities through education. I’m running for school board because Denver students and families need that experienced advocate now. I am running for (a student named) Flor, so that she knows this District does not believe she is illegal and that when we say kids will be college ready, we mean that for all students, including undocumented students. I’m running for Peter and his little siblings, so they don’t internalize a feeling of failure after going to four different schools that have been shut down. I’m running for teachers like Julia, who wants to retire as an educator but is unsure if she can afford to do so here in Denver or if she has enough support to meet the needs of her students. I’m running for parents like Shanae, who just wants to walk her 1st grader to a good school. These are tough and urgent issues, and in a district as diverse as District 4, there are few black-and-white answers. However, there are values that we all aspire to: transparency, inclusivity and equity. 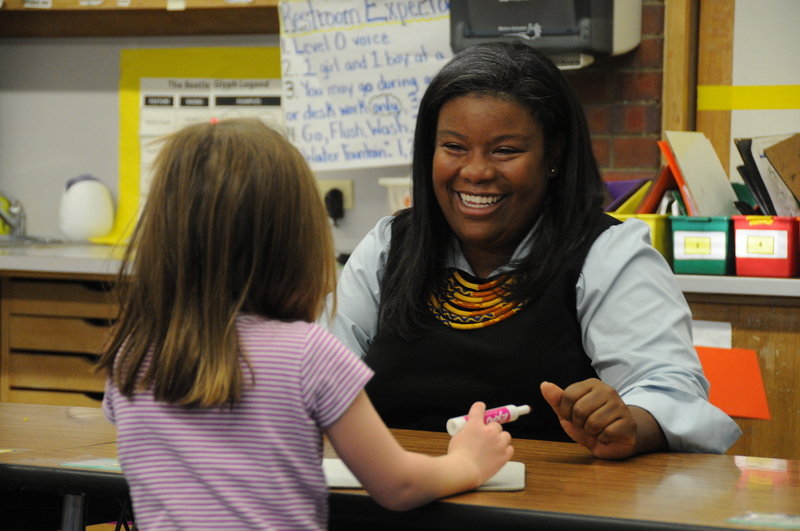 I’m running for school board because I’ve been successfully advocating for kids and families my entire career and Denver Public Schools needs that advocate, who will put people and processes first. What lessons from your experience will you take to the board? I taught middle school math and will always remember our unit on fractions. We created a project based on cookie recipes and students had to manipulate the ingredients to practice the mathematical rules of fractions and then actually bake their cookies. I’ll always remember the creativity and problem solving I overheard from students that day. But I also heard compassion for their community (e.g., “Maybe we can borrow some oats from the neighbor?” “Yeah, but remember they’ve got little kids that might need it for breakfast.”). I hope to bring that same creativity, focus on working the problem, and care for our community to the board. What do you see as the biggest issues facing the district? How do you think you might approach district problems differently? District 4 has been the epicenter of so much change in Denver and education over the past decade: the challenges of schools facing increasing and declining enrollment, the opening and closing of schools, the implementation of the School Performance Framework (SPF). I’m running because we need an advocate on the board, someone who can represent teachers and our community who will work to provide a stable foundation for all our schools. My experience as a teacher, lawyer, and community organizer has molded a different style of leadership than the current board. I believe that process matters and the people most impacted by decisions – teachers, families, and students – need to be included in decision-making processes on the front end. Right now, too many decisions are made by central office without community input.